New life to the French yacht manufacturer Dufour was given when management succeeded to take the firm back from German Bavaria. Since then three new models have seen the light of day which proved that good business draw was done. The smallest of the three new models is Dufour Grand Large 310, while the most popular so far seems to be Dufour Grand Large 410. 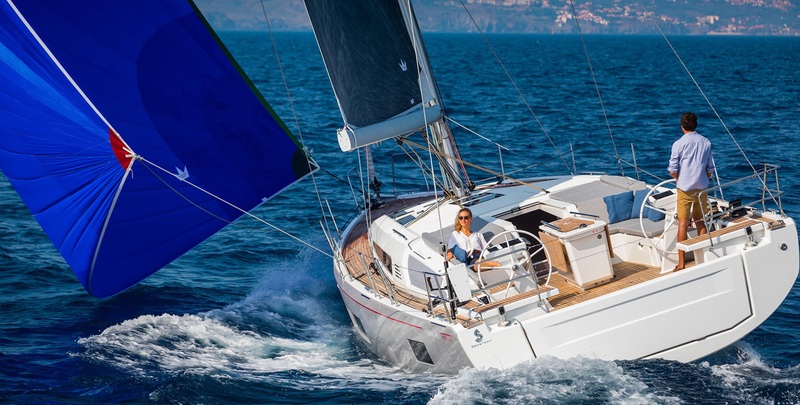 The largest, Dufour Grand Large 560 gains her fans slower, but still well enough. Dufour Grand Large 410 was born as a result of long and fructuous cooperation with Felci Yachts Design. 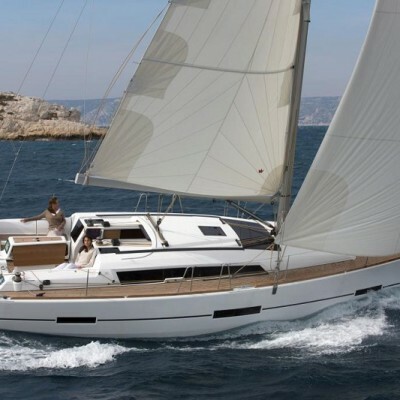 Gracious lines, simple but adorable layout along with latest structural solutions characterize the new Grand Large 410. Her longitudinal side windows and large panoramic in front of low superstructure emphasize a modern look of this vessel, allowing lots of natural light in the interior; which is the latest trend in the shipbuilding industry. The hull shape is designed as a result of efforts to optimize performances and accommodate pretty voluminous interior. It is built by using vacuum infusion in the sandwich which increases the noise reduction as well as longitudinal stiffness. In combination with L-shaped keel with 2.1 m draft, Grand Large 410 has exceptionally low barycenter, which significantly increases her stability. The deck is characterized by spacious and ergonomic cockpit with twin steering wheels and an interesting intervention in the trunks beneath the benches. Their sides are foldable and could be lifted to the level of the seats, making two exceptional sunbathing platforms, with additional cushions attached. The unique modularity concept implemented in Grand Large models refers to their interior layout. The navigation table, fully functional during under way, easily converts to a comfortable and adjustable sofa. The master bedroom which is equipped with cruising comfort also could be transformed into a cinema room, and much more. The interior layout is available in three options. First one is equipped with two aft double bedrooms, one shower/toilet to port, spacious saloon with navigation table and galley; and a spacious forward cabin with a smaller double bed and lots of storage space. The second option considers one aft double bedroom to starboard, large aft storage space to port, luxurious and spacious separated toilet and shower to port, large saloon with lounge area, dining table, navigation table and a galley; with a spacious forward cabin with a smaller double bed. The third option has two shower/toilet compartments – one to port, between two aft double bedrooms and a saloon; and the other belongs to forward double bedroom. 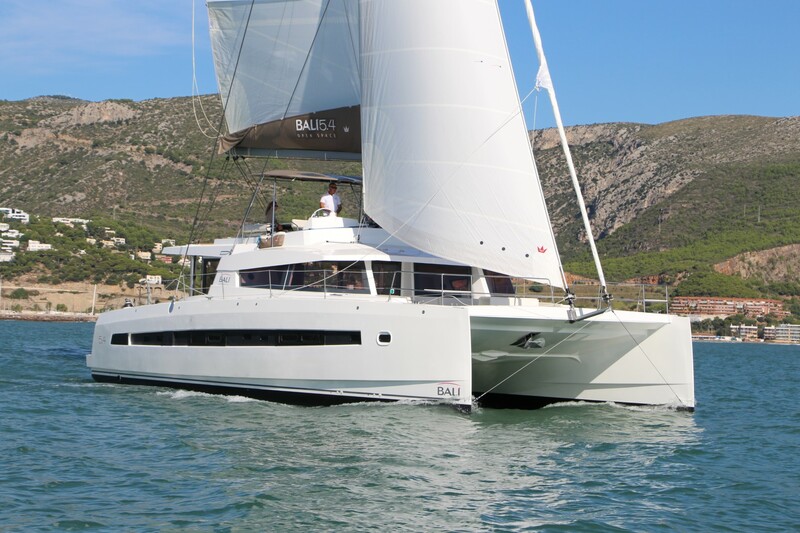 Dufour Grand Large 410 is powered by Volvo Penta D2 40 while her total sail area amounts to 80 m². Her LOA is 12.4 m with the beam of 4.2 m and a standard draught of 2.1 m. The fuel tank has the capacity of 200 l while water tank can take as much as 380 l, which is more than enough for leisure sailing trips. Some critics claim that Dufour Grand Large 410 looks undefined and unfinished for her square and simple lines, but I found it modern and elegant, without needless details. Still, her commercial success both among charter fleets and private owners proved it is a fine yacht, for sure.